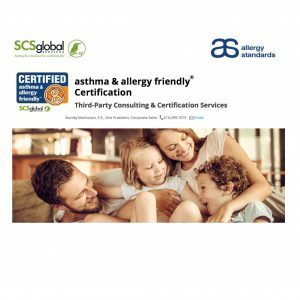 As announced in a press release published on the 15th November SCS Global Services is now approved by Allergy Standards Limited (ASL) to offer the asthma & allergy friendly® Certification. This strategic initiative, announced at the U.S. Green Building Council’s annual Greenbuild International Conference and Expo, will further strengthen and expand the asthma & allergy friendly® Certification program’s accessibility in the green building product manufacturing sector as well as grow the Certification Program internationally. “SCS’s depth of knowledge about product manufacturing and supply chains, combined with the breadth and reputation of ASL’s standards, should help companies deliver qualified products to the business and residential markets,” he added. Current categories of certified products include flooring, insulation, wall paint, HVAC, furnace and automobile air filters, as well as bedding, toys and cleaning products. Additionally, certified electronics and appliances include washers, dryers, vacuums, air purifiers, humidifiers and dehumidifiers. asthma & allergy friendly® products can be purchased around the world, including at U.S. retailers, such as The Home Depot, Bed Bath and Beyond, Target and Amazon. Click here to read the full SCS press release. Click here to read the full ASL press release. SCS Global Services, green building, asthma & allergy friendly®, Certification Program, standards, science. Click here to read more about SCS Global Services.